We have wide range of flavours which any other brand in India doesn’t have; we prefer more natural base formulas which ranges from Natural Cocoa to Artisan Vanilla. 35 mouth-watering natural flavours to melt your hearts. 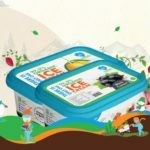 From normal vanilla ice creams to sugar-free ones, from the most common chocolate ice creams to seasonal specials such as Kala Jamoon and Sitaphal, Iceberg serves 35 different flavours. Why galaxy marble is used? Galaxy marble stone is known for its temperature holding property and this makes it apt for ice cream making. Do you have varieties in sauces? We have a total of 9-12 assortments of sauces, starting from butterscotch and chocolate to blended natural products and nectars. Does Cold Stone exists in all the stores of Iceberg? Yes, the vast majority of the stores have the cold stone; on a lot of establishment enquiries and in light of accessibility of various advancements, recently opened small kiosks are without cold stones.